Double IPAs not doing it for you? How about some beer from an ancient Peruvian society. Not typically known for their brewing prowess, the Field Museum plans to launch a limited-edition beer made with the same ingredients used by the Wari, an empire which flourished in Southern Peru from 600 to 1000 A.D. The beer, which will be officially unveiled early next month, uses purple corn and molle berries – both of which were found in artifacts at the site of an ancient Wari brewery at Cerro Baúl in southern Peru, which was being excavated by a team of Field Museum researchers and collaborators. Their research also concluded that the brewery would have been able to produce 1,500-2,000 liters of beer in a single batch. Using the research as inspiration, the Field partnered with Logan Square's Off Color Brewing (which previously produced the museum's Tooth & Claw beer) to create a version of the ancient recipe. 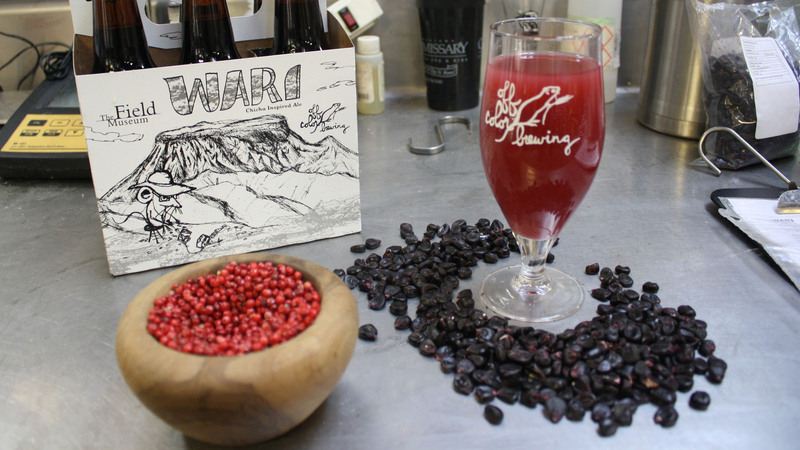 The final product, a pink-hued beer with a light flavor profile, was made using indigenous Peruvian ingredients. The museum debuts the beer March 3 with a tasting event which will also showcase artifacts from the Wari brewery site. The $35 tickets include a glass of Wari and food pairings. For more information, visit the Field Museum's website.